Elwynn Forest. Trees, apples, sheep. The picture of wonderful familiarity. Home to humans and the capital city of the Alliance, Stormwind. Despite near-constant war and the losses and hardship that come with it, the denizens thrive in their day to day, keeping their farms, their taverns, their businesses both in and outside of the great city. This porridge, however, was one of my favourites to make. 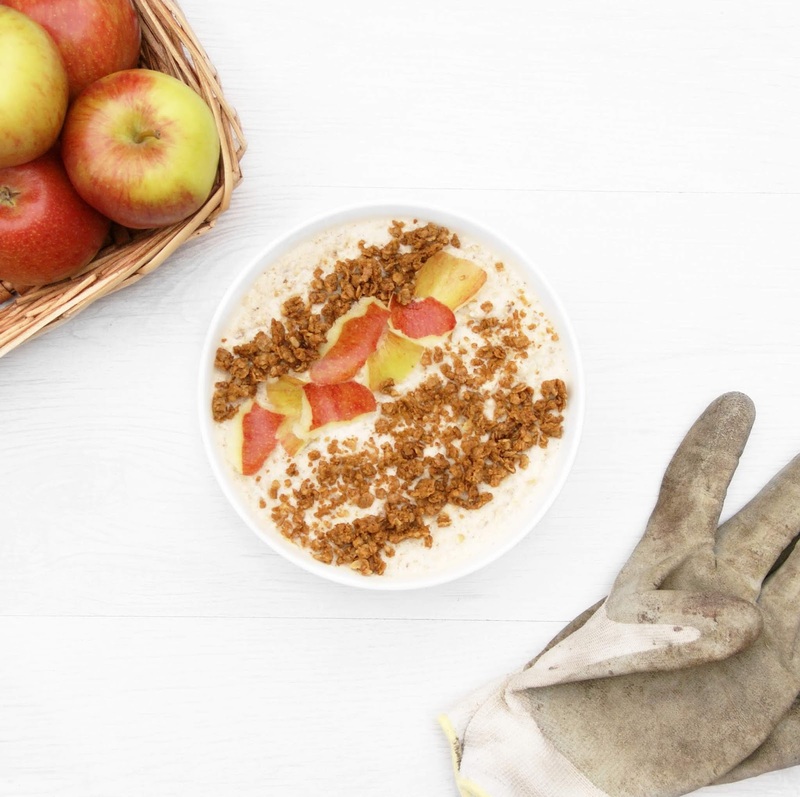 I love apple crumble, so an apple crumble porridge was such an obvious step. And with Elwynn's orchards, it was a no-brainer. This porridge embodies homeliness, comfort and the simplest of pleasures. It's not sugar-free - caramelised oats, by their very nature, involve added sugar - but it's so worth it, and the oats can be stored in an air-tight jar for a few months. I know. I made this porridge a month ago and I still have a small jar brimming with perfectly crispy crunchy oats. They're great to add to any porridge, or indeed ice cream and dessert, or as a cheeky sweetness to homemade granola. I have, however, provided nutritional info at the foot of the post without the crumble topping, for those who would rather opt out (madness), and the nutritional info for one 15g serving of the topping by itself beneath it. 1. Preheat the oven to 325 F/160 C/Gas mark 3 and line a baking sheet with parchment/grease proof paper. 2. Melt the butter and sugar in a saucepan over medium-low heat, bring to the boil, then allow to boil for about 1 more minute, stirring continuously. 3. Remove from the heat and pour in the oats, stirring to thoroughly coat. 4. Spread over the prepared baking sheet and flatten out - use a spatula, back of a spoon, etc. 5. Bake for 10 minutes, then remove, break the oats apart, then bake for another 6 minutes, careful not to let them burn. 6. Remove from the oven and allow to cool, then transfer to an airtight container. 1. Combine the oats, cinnamon and whey in a bowl (or shaker bottle) and, stirring all the while, slowly add the milk and mix until combined (or shake the bottle and transfer to a bowl). 2. Set in the fridge overnight. 3. To heat the following morning, add 50ml water and microwave for 1 minute. 4. Stir in the apple pieces (see below). 5. Heat again for 20-30 second bursts, stirring in between, until desired consistency is reached. Garnish with the apple peel, if reserved, and 15g of the caramelised oats. 1. Peel, core and chop an apple, reserving skin for topping if desired. 2. Set in a saucepan with 2 tbsp water and heat over medium-low for 10-15 minutes. You can then either mash with a fork for a rough puree, leave as softened chunks, or do a little bit of both. Set aside. 3. Boil 100ml water in a kettle. 4. Combine the oats, cinnamon and whey in the same saucepan, then, stirring all the while, add the milk, then the boiled water, and heat over medium, bring to a boil, then reduce to a simmer for 15 minutes until desired consistency is reached. 5. Transfer to a bowl, garnish with apple peel, if reserved, and 15g caramelised oats. • I used Stork 70% vegetable spread instead of butter, which cut off 6 calories, 1.3g fat and 0.9g sat fat from a 15g serving (36 cals, 7.8g fat, 5.4g sat fat from the full yield). • I stored the remaining caramelised oats in an airtight jar. They can be used on ice cream, porridge, added to cereal, with fruit, and so on.